Seabourn passengers have a wealth of options when it comes to dining. Japanese-inspired Sushi is one of the newest. 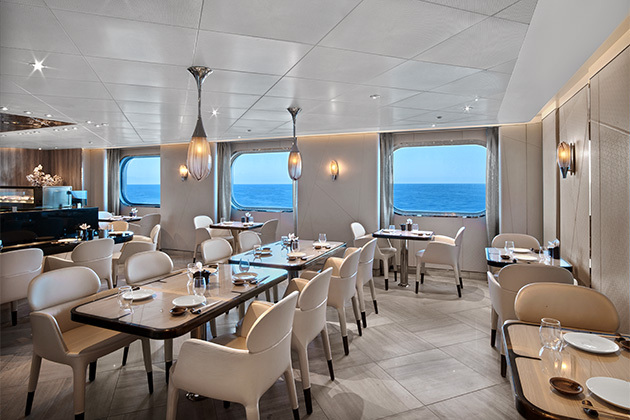 Available on Seabourn Encore, Sushi offers a high-end dining experience in a casual atmosphere. Authentic ingredients, including fish, come from Japan, as do many chefs and members of the wait staff. Wait staff greet passengers by saying konnichiwa, bid farewell with sayonara and say thank you with arigato. They're also expert at helping diners pick the right dishes for their tastes. Sushi is open for lunch and dinner, and the menus are different in the afternoon than they are in the evening. At lunch, you'll dine on bento boxes, with options like miso salmon, ramen noodles and teriyaki chicken. Boxes include salads, miso soup, rice and pickled vegetables, and diners use slick black chopsticks and deep ceramic spoons (though forks and knives are available upon request). At dinner, it's all about the sushi and sashimi. Passengers can start with small plates such as bonito tataki, eat salads topped with light sesame dressing or share a bowl of edamame. Items like tuna akami, salmon or squid are served either as sashimi or nigiri, and specialty rolls, including hamachi or oyako, are available. Sashimi and sushi combination plates are offered as well. Portion sizes are perfect: small enough that you can sample several courses without filling up. Which is good, because you'll want to save room for dessert, which includes a decadent green tea custard. Sake, Japanese beer, specialty cocktails and tea, served in artisanal cast iron pots, are the perfect complement to your meal. You can't order from the dinner menu at lunch, nor can you order from the lunch menu at dinner. Sushi's menus have a few vegetarian options, but not many. If you don't eat seafood, skip Sushi for dinner; you'll probably find you won't have enough other options there. There is no additional fee to dine at Sushi. Passengers can eat here as often as they wish. Seabourn's Sushi can be found on Seabourn Encore, and will also be on Seabourn Ovation, when it debuts in 2018.